I hope the idea is clear enough. This would be adequate for my purposes except that I want the lines to be curved, i.e. this should be two arcs between (t) and (b), not this ugly diamond-shaped thing. 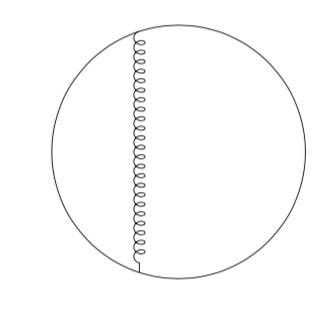 I think what I want to do is just draw the two arcs from (t) to (b) and then define some vertices "along the arcs" with which I can make the gluon line, but have struggled to figure out how to do this. Because this diagram is part of a larger equation of diagrams, I would prefer to use absolute vertex positions for at least (t) and (b). UPDATE: Flexible answer. You can change the position at will by adjusting .3 and .7 to your needs. 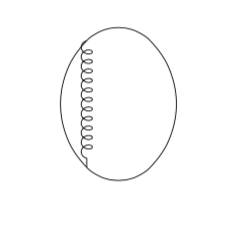 ORIGINAL ANSWER: (Just in case someone wants to do this within a diagram of tikz-feynman. You can work with quarter right. Then some of your vertices become unnecessary.